When it comes to bloating, flatulence, hyperacidity, heartburn, and the supporting the digestive system, the combination of three culinary spices—cumin, coriander, and fennel will rock your work. Commonly known as digestive aids, these three spices make the ayurvedic tea called CCF. A gentle, yet effective decoction to support the digestive system. The alchemy of these three spices created a balanced, effective, natural gut cleanser. In Ayurveda, all imbalances begin in the gut and supporting gut health is a key aspect to balanced health. When the digestive system is strong, free of blockage, congestion, stagnation, gas, undigested food, it not only supports nutrient absorption but also maintains vibrant health. While all three spices are known to be digestive aids, have carminative properties, boost digestion and stimulate the lymphatic system, they each also have their own unique benefits. Cumin helps remove any blockages, stagnation, or build-up of ama (accumulated, undigested food), relieving congestion in the digestive tract. While coriander is known to calm spasms, reduce excess acidity and inflammation. And fennel, the sweeter of the two spices is renowned for aiding with intestinal cramping, moving the lymph, and relaxing any tension in the digestive tract. When combined, and decocted to release their nutrient rich, volatile oils–CCF tea makes for a powerful elixir. Supporting the bodies natural detoxification process, which then helps rejuvenate the digestive fires. 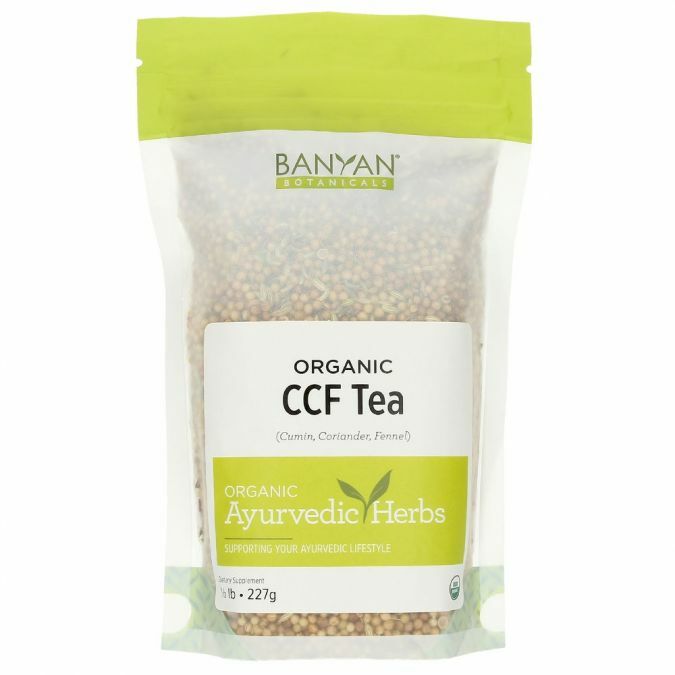 Through case studies shared by my Ayurveda teachers, they have found CCF Tea to play a role in balancing blood pressure rates, calming anxiety, reducing PMS and hormonal fluctuations, in addition to relieving acidity, bloating, and flatulence. The key is consuming this decoction of three culinary spices used in the cuisines across the world with regularity, especially if there is an imbalance like acidity, excessive gas or feeling bloated after each meal or by the end of the day. A warm decoction can be consumed daily, up to 3 times a day for four to six weeks when seeking to recalibrate. After that once a day or once a week for maintenance. The results for most, including myself, can be felt within a few days. Happy drinking. Happy digesting. a decoction made with three culinary spices to help boost digestion, prevent acidity & bloating and so much more! Fill the pot with 1/2 of the water. This will help eyeball what the final amount of tea will look like in the pot. Then add the remaining cups of water and all spices. Bring the water to a boil and then simmer on medium to medium-high heat until the tea reduces to half. Strain and serve warm or store when cooled in a glass jar. Tip: make a big batch for the entire week and store it in the refrigerator. When you are ready for a cup, heat the amount you want. Or fill up your thermos for a day’s worth of hot tea. Any size batch will store for up to a week. Add-ons: In the cold season add a slice of ginger or 2 and finish with a squeeze of lemon. In the summer finish with a few sprigs of mint. How does the tea work on such a wide range of imbalances? No matter what the dis-ease, in Ayurveda it always comes back to the root—digestion. What we cannot digest leads to ama or toxins—whether its physical, emotional or mental. For the purpose of this post, we are referring to toxins that have accumulated in the physical body, such as in the digestive system, and/or within one of the seven tissues, plasma, blood, muscle, fat, bone, marrow, and reproductive. 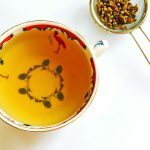 This tea will not only prevent a build-up of toxins by increasing the digestive fire but at the same time, it will begin to remove accumulated toxins. So as it cleanses, it will also rejuvenate the digestive fire, preventing toxins while supporting better absorption. How long will it take before I see results? Depending on the dis-ease, the person and factors, like, the time it took for the dis-ease to manifest, seeing benefits from this tea may vary. For example, excessive gas or bloating may present itself within an hour. 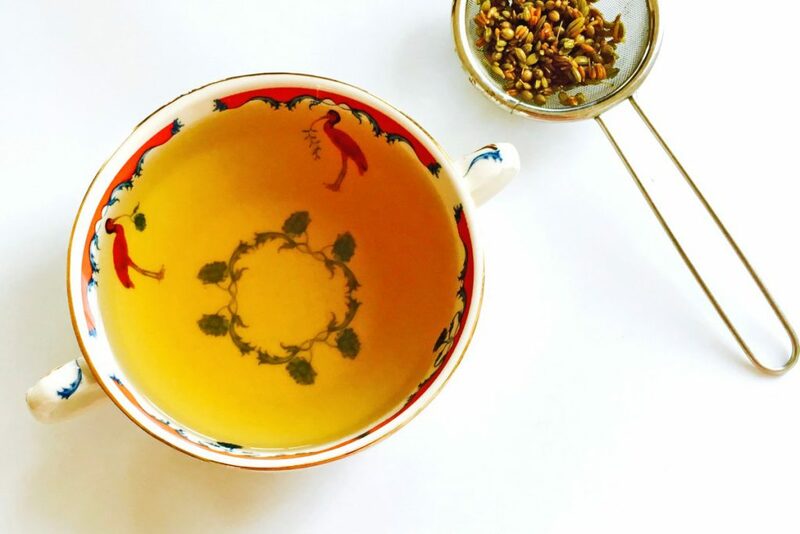 Drinking this tea may help aide this type of imbalance within a few servings and if taken continuously over a week, it could prevent gas or bloating completely. Whereas seeing the benefits from an imbalance like arthritis, may take longer, as it is a disease that is deeply rooted in the body (to clarify this tea not will cure arthritis, but it may be able to help with side-effects like a low digestive fire because physical movement may have been reduced or impaired). 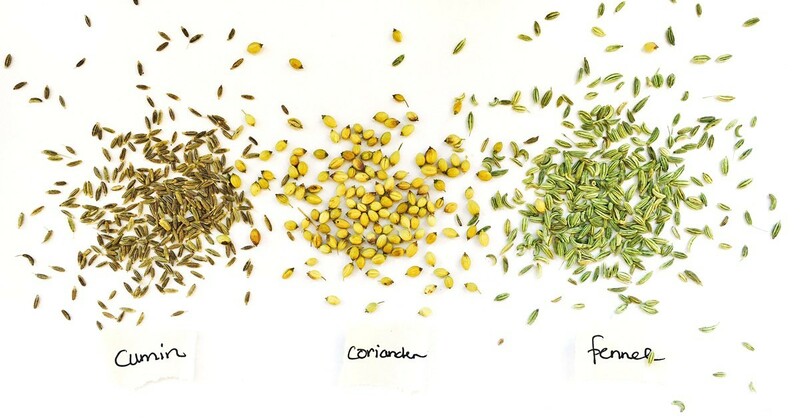 Why—these three spices? Aside from being rich in nutrients, minerals, plant-based compounds, the combination of these three spices have the ability to do two key things, which directly relate to the root cause of imbalances. Ignite the digestive fire to prevent ama, or toxins. Remove ama that has accumulated within the body. It breaks down the gunk while igniting that flame (aka the digestive fire), thus preventing the build-up of toxins and in some cases may even result in weight loss. It can also benefit imbalances of the mind and emotions if they stem from the build-up of ama in the physical body. In addition, these three spices together are energetically balanced. Making it tri-doshic—a good spice combination no matter what your body type or season. What is the benefit of boiling the spices versus steeping them in hot water? To really see the benefit from herbal or spiced teas, generally, spices/herbs need to engage with hot water for much longer than 3-5 minutes, in order to extract the essential oils. When boiling the spices and reducing the quantity by half, the spices have now had a chance to transform through the aide of fire (heat) and release their medicinal qualities. In using this method, the benefits of this tea will be seen much quicker. I had a client that was steeping this tea for weeks and when she followed the proper method she felt the difference in just a couple of days. Take the time—making your own medicine is a process, and your body will appreciate the love. I’m doing a cleanse in which I’m making adjustments to my diet and lifestyle: 1-2 times a day. First thing in the morning, and/or in the late afternoon/evening. Enjoy the same amount of days as your cleanse. A cleanse with no adjustments to diet or lifestyle: 3 times a day. First thing in the morning, in the late afternoon and in the evening for 3-4 weeks. PMS: 1-3 times a day. First thing in the morning, in the late afternoon and/or in the evening starting a week or two prior to your cycle start date. Indigestion like gas, bloating, acid reflex: 3 times a day for 1 week, and then reduce to 1 time per day, as a preventive measure. Strengthen the digestive fire: 1-2 times a day, daily for 2-3 weeks and then 1 time a day for as long as you wish.